Comments: A perspective changer. I was aware of the IMF, The World Bank and the World Trade Organization thanks to social science classes in middle school. But, I had no idea of the role they play in (arresting) the development of developing nations. 1. Every developed country rose to power thanks to protecting infant industries via imposing tariffs or protecting patents. But, they’ve sold the idea of free markets to the world so it is impossible for countries developing right now to do it. The US was the most protectionist country in the world until the Second World War and grew the fastest. Britain and the US had tariffs as high as 50%. 2. This is particularly because the IMF, World Bank and WTO (i.e. 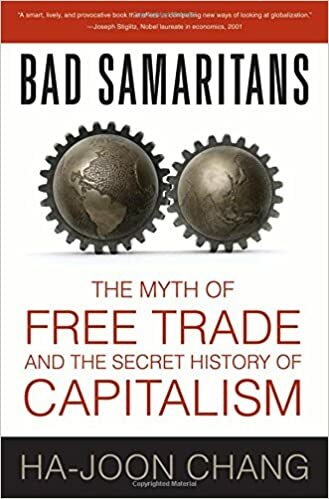 the bad samaritans) are run by developed countries and only offer aid in exchange for policies that suit developed countries. It is very hard for poor countries to out-negotiate the rich countries in Geneva given paucity of resources. 3. In the first few years after 1900, multiple books described the Japanese as lazy, care free and emotional people. Similarly in the 1800s, the British and French described Germans the same way. Economic development often creates the culture it needs. Hard work, time keeping, frugality often follow economic development.